Process is an exhibition that highlights the artists’ method of the creative process. It is an exploration of ideas that are sometimes driven by intuitive play or logical planning by the artist. The aim of the exhibition is to show artists’ work in progress: Ideas and processes that may eventually become finished artworks. The final work is often simpler (or more complex) than the processes towards it may indicate. From the process work, other paths can develop that may further inspire the final product. Process-oriented work is frequently seen by the maker as material either of high value or alternatively, not significant enough for exhibition. An artist, having arrived at the final result might not even attribute to the process the importance it may inherently possess. Process focuses interest on the processing of ideas, random acts and unusual use of materials, improvisation and accidents, before the final product. In short: evidence of journeys in conceptual expression that may transform into the prized artwork. This has previously been referred to as ‘’the physical manifestation of a thought process”. So with few restrictions and boundaries, you are invited to submit. Any process work in any medium may be submitted (No later than Saturday 09 February 2019) for selection. Each entrant may submit a minimum of two and up to five artworks for consideration. 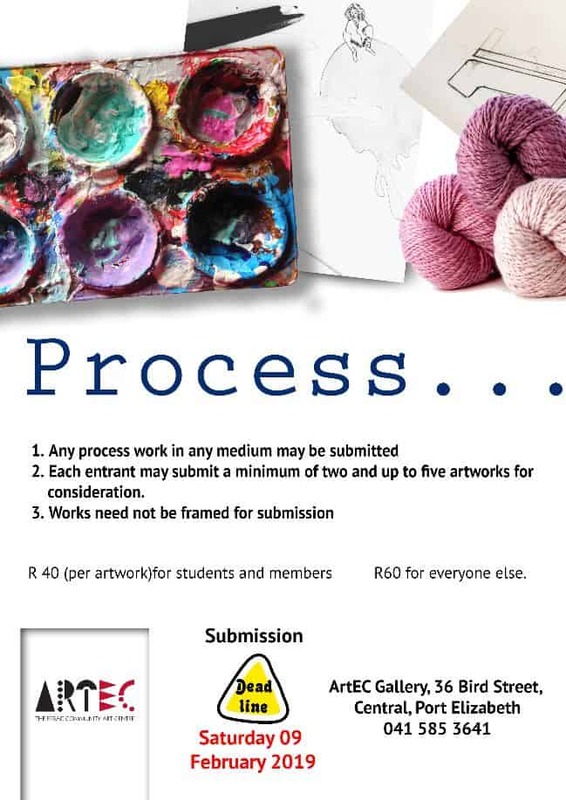 Entry fee of R30 (per artwork) for students and members, R60 for everyone else. All works must be clearly marked with the name of the maker and title (if any) of the work(s). The participant will bear the responsibility for the safety of the exhibits and any other property whilst at or in transit to and from the Centre. It is assumed that at all times the participant will arrange insurance against any personal loss or damage. A commission of 30% will be levied against all sales. All artists are responsible for all transportation costs incurred to and from the Gallery.